Homemade Singapore Laksa with Shrimp and Tofu is a local favorite and loaded with flavor and fragrance! It’s a seafood lover’s dream! Drain the tofu and wrap with paper towels or a kitchen towel to get rid of the moisture. Let sit for 10 minutes. Then cut the tofu into even-sized 1-inch cubes. Heat a sauté pan with the canola oil over medium-high heat. Sauté the tofu cubes until golden brown on all sides. Remove from the heat and set aside. In a medium Dutch oven or sauce pot, heat the coconut oil over medium-high heat until melted. Add in the Thai chili peppers and laksa paste and stir for 1 to 2 minutes. Add in the seafood stock, coconut sugar, and kafir limes leaves and bring to a slow simmer, then add in the coconut milk, fish sauce and lemongrass. Bring to a boil and lower to a simmer for 10 minutes. Meanwhile, cook the rice noodles according to package directions. You’ll want them al dente, but not mushy. Drain and cut the noodles into smaller pieces if so desired. Set aside. Add the lime juice into the soup stock and stir. Then add in the shrimp and cover the pot. Remove the pot from the heat and let the shrimp cook (off of the hot burner). This should take about 5 to 7 minutes. 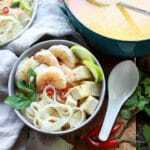 When ready to serve, add the rice noodles into a soup bowl and ladle the laksa on top of the noodles, evenly dividing up the shrimp and tofu among the bowls. Top with your favorite garnishes like fresh mint, lime wedges, fried garlic, and beansprouts. You can find store-bought Laksa paste at most Asian markets, or purchase it here on Amazon. Fresh kafir lime leaves are often available at most Asian markets. Some grocery stores, like Whole Foods, will carry the dried version. If you can’t find fresh Thai chili peppers, use the dried version (whole) and remove them when serving. You can also substitute the fresh peppers for red chili flakes or red jalapeno peppers.